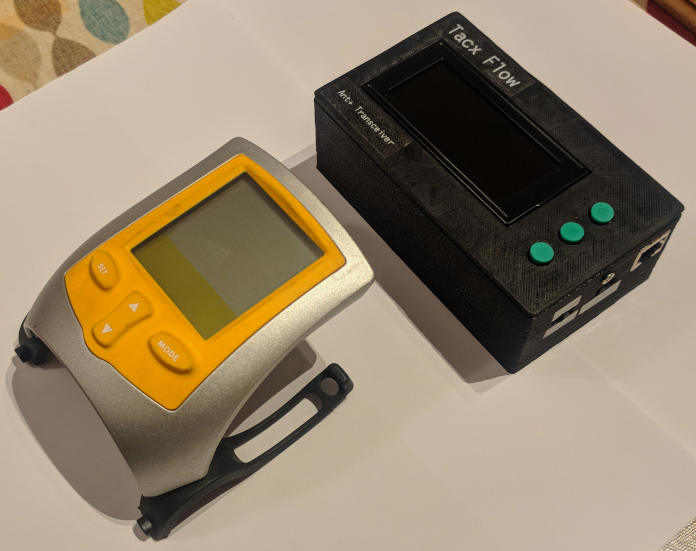 I expect this to be an issue way down your list of priorities, but I’ve made an adapter to add Ant+ to my aging Tacx Flow (the yellow one, T1901) which came without a usb or ant+ computer. It works fine with the likes of Zwift, pairs and is able to transmit power and receives requests to control the resistance of the magnetic braking unit. When using with VirtuGO it gets detected and pairs fine, power is picked up but it never gets any resistance request data. When pairing I see that the software requests the fe-c capabilities which is responded to correctly. But when actually riding, resistance never changes, the software never sends any resistance data to the trainer. During riding it only ever receives the oocasional DataPage55 packet which is user configuration data. Does VirtuGO only work with known devices? On looking at the data from the Zwift software, it never asks for any capabilities information (which it should) and just blindly sends gradient requests whether or not the device says it supports simulation mode rather that just basic resistance. This is probably not strictly compliant with the Ant+ protocol and just trying to be as compatible as possible. I appreciate this is really not a priority issue! Finally… Resistance is transmitted… I used the standard C++ Library from ThisisAnt.com. Does this helps you a bit? What is your fe-c cycle trainer? It sounds like you already have a trainer paired and working and the climb unit just reads all existing packets and uses the ones that contain gradient requests? My controller is the only device, it does actually pair with the Virtugo software and does the initial handshaking to send it’s capabilities, but the software never sends any gradient or resistance packets once running. I have a logic analyser recording all data sent and received, no gradient request packets get sent, only datapage 37 which are information packets with user configuration information. I’m using a Elite Direto. Yes you are right! The Direto is paired to VirtuGo and works fine and than secondly I’m using another ANT Stick to receive all the ANT Traffic and filtering out the specive grade comming from VirtuGo to the Direto. What you mean wih Logic Analyser? I expect you need a second ANT Stick, as only Open Rx Scan Mode can capture all ANT Traffic… and this is only possbile with all other Channels closed on the Stick… So you need automatically a second one. Ok, I see how you are working. My setup is different. I have designed a circuit to replace the Tacx computer, so my device pairs with the VirtuGo software like your Direto does. The logic anaylser is able to log all data packets received, it connects to the rx and tx lines of the ant+ transceiver. My device is able to pair successfully with VirtuGo and transmit power (and cadence/speed) but it never receives resistance or gradient request data pages. The VirtuGo software does query the device for its capabilties, which is responded to correctly but never gets any other data back. So, while it does work, it does not adjust resistance. Looks like I’ll have to try some other software to try it out on. I do not think Zwift is strictly standards compliant when it comes to ant+, but I think it tries to be as compatible as possible by sending the gradient even if it is not supported, which is why it works with my device. Their implementation of drafting is very bad, resistance never changes only virtual speed which is not what it feels like in the real world. I also use my trainer successfully with MaximumTrainer which works fine, and is able to set resistance correctly. 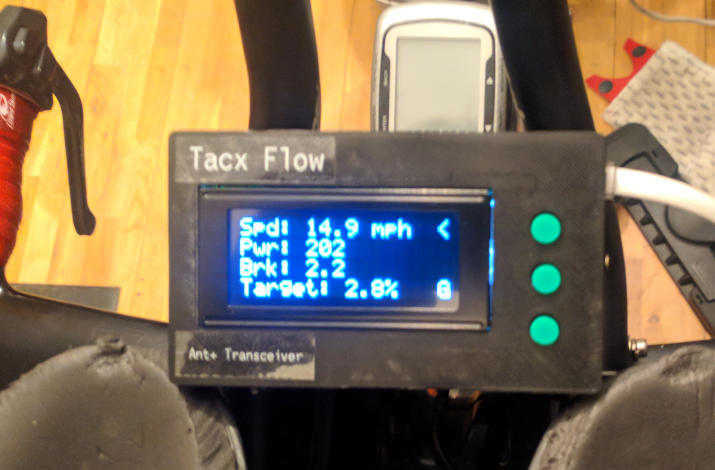 I would love to reanimate my old Tacx Flow with your solution. Would you mind to share some details? Sure, I’ve just redesigned it to put an arduino nano on the board itself but haven’t had a chance to build one up yet. It works fine with an arduino uno but is about twice as big. 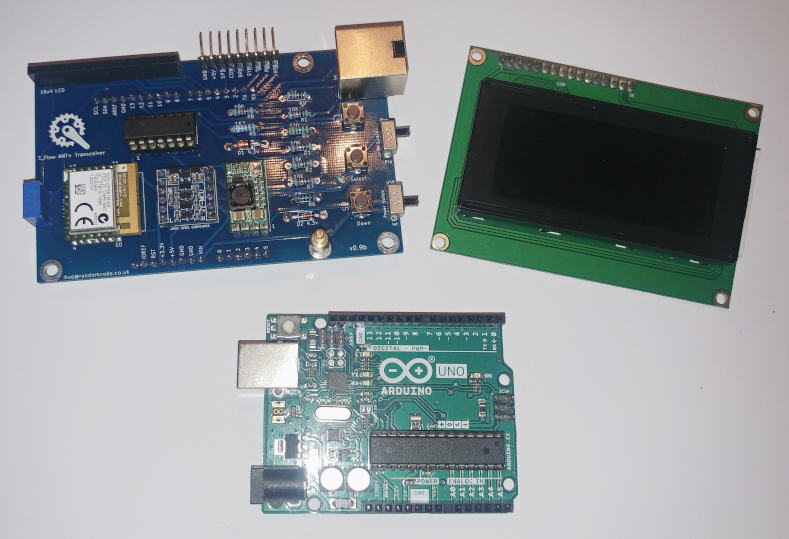 The lcd was one I already had, a text 16x4 module, an ANTAP281M4IB module for the ant+ wireless transmission and a few other common parts. …also worth mentioning that I never got it working to have virtugo control resistance, it does work transmitting power and so the courses can be ridden but not with resistance control. It has worked with all other software I have tried it with. I think I saw your post on thisisant.com on calculating the gradient from data page 51. What are you using for an actuator? Curious what your setup looks like, sounds like a fun project!